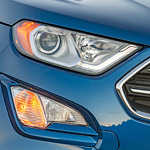 Ford's long history of vehicle innovation continues with its popular compact SUV, the EcoSport. With a compact frame, comfortable interior and the agility to navigate busy city streets or the beckoning open road of the highway with equal ease, it's an excellent choice for a broad range of drivers. The direct injection turbocharged engine of the Ford EcoSport comes in either a one- or two-liter option, delivering up to 166 horsepower and up to 149 pound-feet of torque. An optional intelligent four-wheel drive system allows the EcoSport to adjust to road traction on a moment by moment basis. The towing capacity of the EcoSport rates at up to 2,000 pounds, perfect for personal watercraft, ATVs or a small trailer with cargo. If you'd like to take a closer look at a Ford EcoSport, you're invited to stop by Palm Springs Ford. We can arrange for you to take one out on the road for a test drive and answer any questions you might have about its capability features.